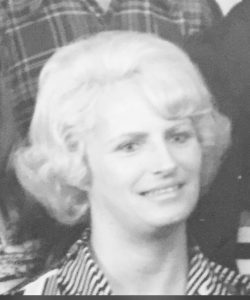 Jeannine (Luneau) Lewis, 75, of Merrimack passed away on Saturday, March 26, 2016, at St. Joseph Hospital in Nashua, after a period of declining health. She was born in Berlin, NH, on October 17, 1940, one of six daughters of the late Donat and Aurore (Belanger) Luneau. She was raised in Berlin and was a graduate of Notre Dame High School. She and her husband, Donald, moved to Merrimack in 1976. Before retirement, Jeannine worked for Beebe Rubber Shoes and Triangle Pacific, both in Nashua. After retirement, she was an active member of the Merrimack Senior Center, enjoyed gaming, the Boston Red Sox and caring for her family. Along with her parents, she was predeceased by two sisters, Yvonne Roy and Louise Brunget. Surviving members of Jeannine’s family include her loving husband of 55 years, Donald Lewis Sr.; three children, Evelyn and her husband David Currie, III, Donald Lewis Jr. and his wife Janice, and Dyana Lewis; 10 grandchildren, Courtney Deloge, Whitney and her husband Damon French, Sidney Currie, Lane Currie, Donald Lewis III, Nicole and her husband Nathan Barnett, Eileen and her husband James Robert Santerre, John Treacy, Lauren Treacy, and Ryan Lewis; three great-grandchildren, Jackson French, Jackson Santerre, and Lillian Barnett; and three sisters, Cecile Therrien, Florence Aubut and Annette Castaneda. Calling hours were held at the Rivet Funeral Home, 425 Daniel Webster Highway, Merrimack on Wednesday, March 30th, from 5-8 PM. Funeral services were held at the funeral home on Thursday, March 31st, at 10 AM. In lieu of flowers, memorial donations can be made in Jeannine’s name to a charity of one’s choice.